When you’re an MIT student, the outside world doesn’t always know what to do with you. “MIT,” you might be told. “How nice.” A person who says this has no idea what MIT is, let alone what you might be doing there. (“Nice” is a vague sort of word that tends to indicate indifference, disinterest, or ignorance.) People for whom the words Harvard or Princeton conjure up pleasant images of leafy campuses and sweater-wearing intellectuals usually have a very hazy idea, at best, as to what MIT is all about. For most that know it at all, MIT is Geek Central -- a bunch of Dilberts milling around conducting strange experiments, building diabolical contraptions, and figuring out new ways to graft computer hardware to human flesh. Only in cultures not American is the view of MIT any better. In the United States, science, engineering and technology are so negatively presented that most Americans view the typical MIT-type as a hopeless geek. Elsewhere in the world, an MIT-style education is prized to such a degree that foreign tourists, thousands of them every year, visit the MIT campus simply to snap pictures of the Great Dome. How many tour buses pull up in front of 77 Mass. Ave. to disgorge forty camera-toting Midwesterners? Are we geeks? I don’t even know anything about Linux. I’m in urban planning, for cripe’s sake -- light-years away from embedded systems, or thermodynamic equations, or the derivation of a new theory. Hundreds of students at MIT study literature, and music, and political science, and if they were enrolled at a place like the school up the street, nobody would ever think to label them geeks. No, it’s not us; it’s MIT itself that makes us all geeks -- geeks, though, of reputation, not always of behavior. We here at the Institute seem to have devised our own internal definitions of and synonyms to “geek” -- we call people hackers and twinkies and tools, among other things. It’s unsurprising that in a culture of geeks we are cliquey to the point of creating subcultures defined by words that are actually meant to indicate some kind of sub-geek status. But it is one of the hallmarks of MIT that labels, particularly “geek” and all its synonyms, are almost always meant affectionately, or at least benignly. “Nerd Pride” is in fact a celebration of the fondness with which we imbue what anywhere else would pass for insults. 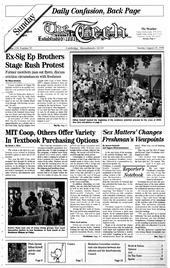 Besides, most MIT students have at one point or another thought of themselves -- whether openly or secretly -- as geeks. MIT’s geeky reputation is probably why many would-be ’tuters apply here in the first place. Students cannot fail to realize how far out of step their acquired thinking on such matters is when they return home for breaks and vacations. Perhaps there are some few exceptions, but for the most part nobody off campus understands anything about the playful geek culture we all so willingly embrace. Particularly skeptical students might even begin to scratch their heads slightly at the idea that anybody not of MIT could understand Dilbert, an icon that seems so representative of geeks in general. Geeks are definitely out of the mainstream as far as popular culture goes, although varying degrees of geekiness are, at varying times, quite fashionable indeed. The ascendance of the personal computer has raised the status of geeks considerably -- geeks are now highly visible and society’s dependence on them is transparent. Technophobes are at the mercy of geeks, and they know it. So we now have an interesting sort of equilibrium whereby Joe Blow simultaneously reviles and fears, is baffled by and depends upon, Ben Bitdiddle and Alyssa P. Hacker. We do not yet have a situation where MIT is held up as a model of higher education by parents’ associations who collectively urge their slacker kids to apply. Sure, MIT ranks third in the U.S. News and World Report survey of colleges and universities, for whatever that useless piece of propaganda is worth. It’s still not in the same league as its academic peers in terms of outside perception. I don’t really have a problem with that; freshmen, if you’re still reading this far, I’m assuming that you don’t either. Smile the kind of satisfied smile found on the faces of people who are convinced they know more than everyone else. You do know something they don’t -- you know about the geek culture. You can appreciate a good hack and laugh at a joke involving integrals, even if you happen to study planning or poetry. That’s the sort of geek culture MIT creates. Get used to it. It’s a lot of fun.